I'm excited to be linking up with Briana from Work Clothes, I Suppose for Third Thursday Threads! This month's challenge was to remix a skirt two (or more!) ways. 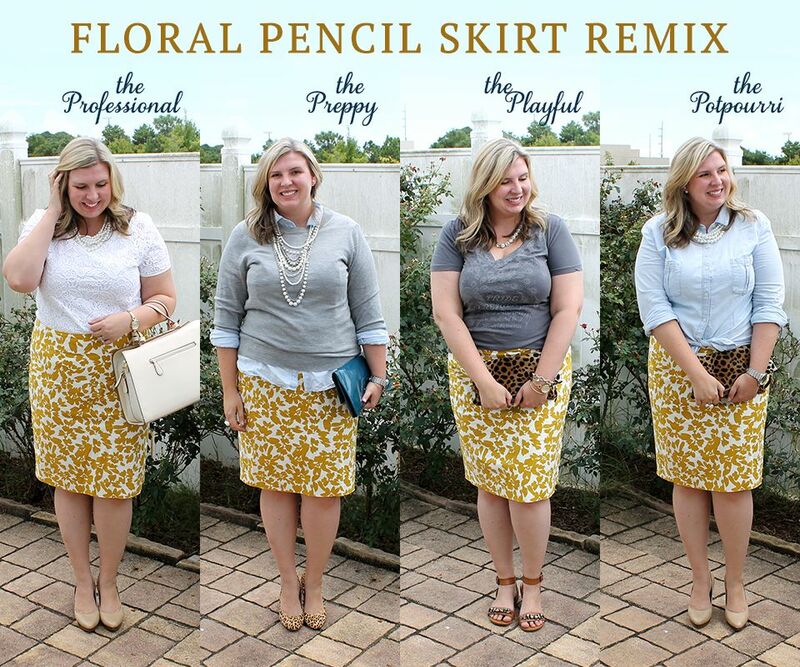 I immediately thought of my mustard floral pencil skirt that I love, but am continually stumped on how to wear it. (You can see how I wore it last here). 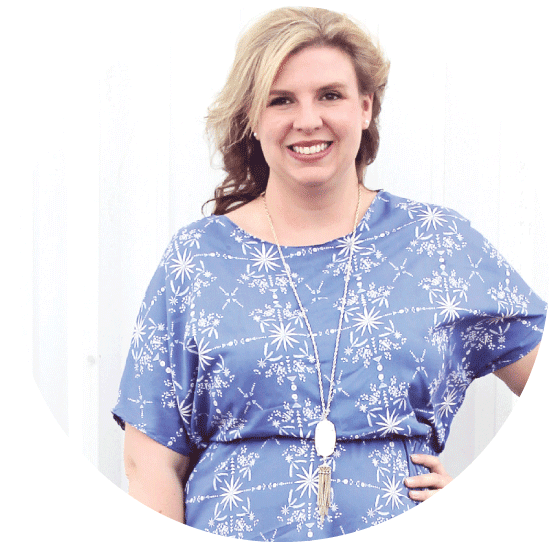 But now, thanks to this fun challenge, I have four more looks to throw into the outfit rotation! Because I'm a nerd, and everything has to rhyme or be an alliteration, or something clever, I give you The Professional, The Preppy, The Playful and The Potpourri. I love the color combination of cream and mustard. 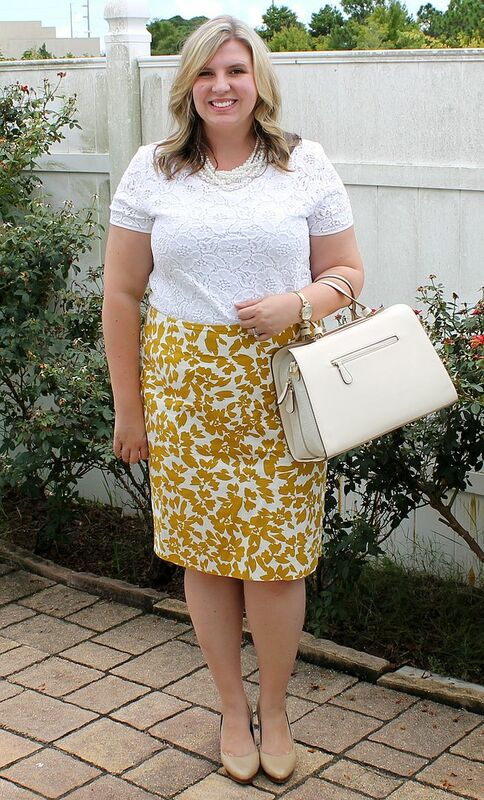 The lace is feminine, the pearls lady-like and the skirt adds of pop of color. The neutral accents help keep it work appropriate. 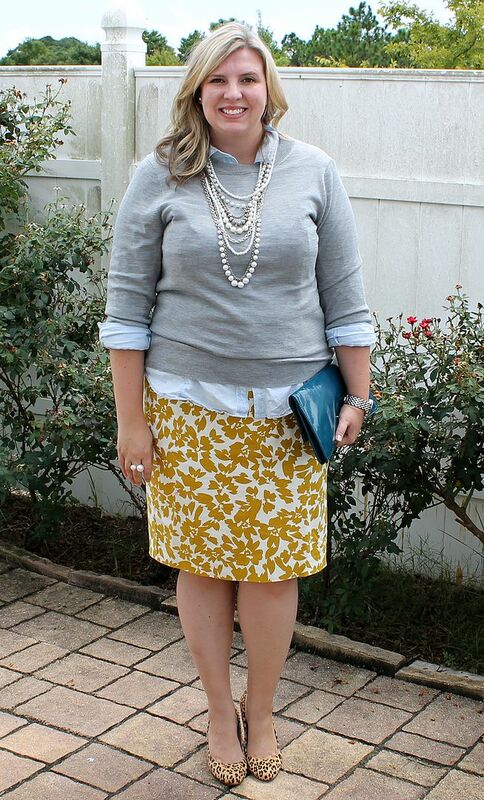 Pops of leopard, chambray, layers and a pearl necklace - it doesn't get much more preppy than this. This outfit makes me feel like I'm back in Tennessee where the outfits are classier, the hair a bit bigger and the lipstick a touch brighter. As I mentioned Monday, I'm a self-confessed weekend slob. Pairing a fun graphic tee and sandals with a pencil skirt, blingy necklace and clutch makes for a fun juxtaposition. Way better than my usual attire of sweats and one of my husband's tees. Since this is a remix challenge, for my last look, I took an item (or two) from the first three outfits to create a completely different look. The necklace and shoes from The Professional, the chambray, watch and earrings from The Preppy and the clutch from The Playful. I plan on wearing the first look with the lace and pearls to a work event tomorrow night, and I can easily see myself wearing the other three looks in the near future. Thanks to Briana for a fun challenge! Love all your looks, but being a professional myself, the first look is my favorite. 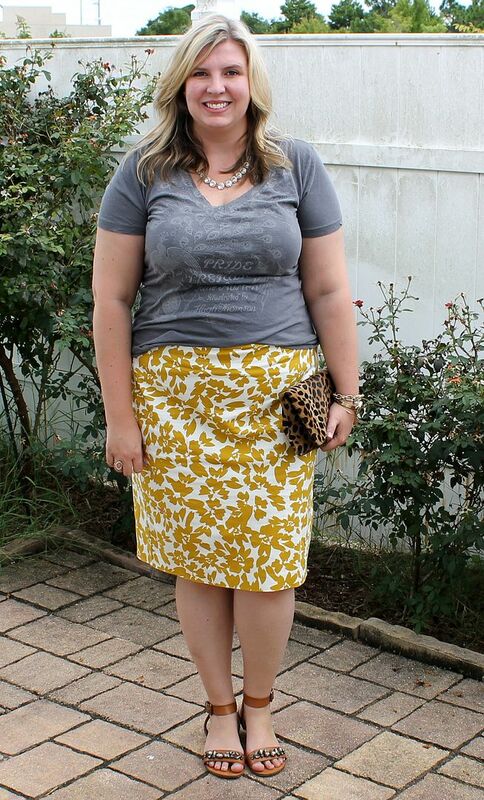 I also like the way you paired the leopard with the skirt. I never would have thought about mixing those two patterns. Enjoy your Thursday. P.S. I follow you on IG! Thanks Anne! I did lots of Pinterest searches and idea borrowing to come up with the looks. For example, I saw a pin where a girl had on a graphic T-shirt and pencil skirt and thought, oh, yeah, I have that gray Jane Austin shirt. Maybe that'll work! Same thing with the lace and pearls. Then for the last look I just picked items that seemed like they would work together. Before this challenge, I'd only thought to wear it with the gray sweater. You can't go wrong with gray and mustard, right? These looks are great! It's so fun when you figure out new ways to wear a tricky item! Thanks Andi! I'm trying to be better about buying items I know I can wear several different ways; so it was nice to find a older piece that can be like-new again now that I've come up with different ways to wear it. 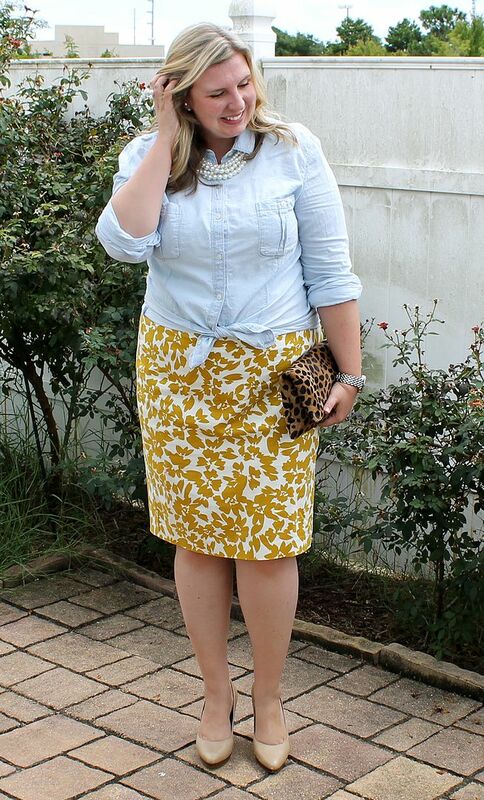 This skirt is so pretty, and I love the different ways you've styled it here! Thanks Inge! I typically stick to solids on bottom, so it's nice to have a fun piece to mix things up with! Love all the ways you've worn this pretty skirt, love it with the touch of leopard! 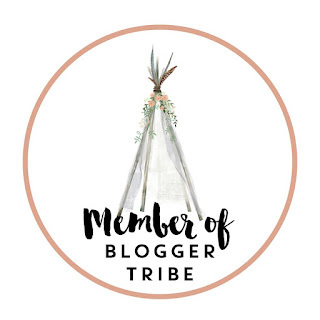 Thank you for joining TBT Fashion link up and hope to see you next week.